SOMALILANDERS:- For the past one year and four months, the family of a Kenya Defence Forces soldier who went missing following the deadly El-Adde attack in Somalia, has been praying for his safe return. The fact that their prayers are yet to be answered has however not dampened their spirits. They are still clinging to hope that their son, Private Alfred Ndanyi, 36, will one day show up at their doorstep. In an interview with the Nation at his Vigina village home, Vihiga County, Dr Epainitus Kilasi and his wife Nifreda Kahuga said they are seeking answers to the whereabouts of their son. 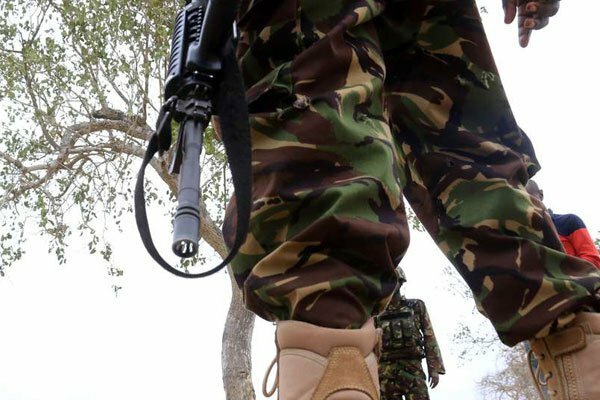 The couple said they have not received any information from the State on whether their son died during the surprise dawn attack by the Al-Shabaab terrorists or not. "He was attached to Moi barracks in Eldoret in the armouries department. He was among the first batch of soldiers who were dispatched to Kismayu at the beginning of the war with Al-Shabaab," Dr Kilasi said. He added: "After the Kismayu mission ended, he returned to the country and attended a seminar at the Lang’ata barracks before he left for Garissa." While in Garissa, Dr Kilasi said his son called him informing him he had been asked to report back to Somalia. He went, never to return. The couple said they were shaken following reports of the attack in the wee hours of January 5, 2016. When bodies were brought home and DNA tests done, their son’s was missing. "One soldier who survived the attack but sustained injuries told us he saw our son and another soldier running away," he added. The plea by the soldier’s parents came a day after a video was posted on YouTube showing someone believed to be Mr Ndanyi pleading with the Kenyan Government to save their lives and enable them to vote in the August polls. In the video, Mr Ndanyi is seen reaching out to President Uhuru Kenyatta to free Al-Shabaab suspects facing trial in Kenya on grounds that the move would save their lives and have him and other soldiers freed. The couple said they watched the video and confirmed it was their son speaking.